In 2007, Netflix rolled out a new service: Subscribers could stream movies without having to wait for DVDs in the mail. Since then, Netflix has transformed the entertainment industry. Today, it delivers over two billion hours of content per month to 57.4 million subscribers. Hotels can take a lesson (or five) from the rise of Netflix. In this on-demand era, your guests are in control. Your service and marketing tactics need to change to keep your guests tuned in and loyal to your brand. The way your guests consume content has changed. For example, your hotel’s marketing department has spent an enormous amount of time, effort, and money on trying to get your guests’ attention. Some hotels have marketing teams that create a lot of content to engage guests. This might include marketing emails, blogs, virtual tours of the hotel, area guides for specific destinations, and more. For 80% of hoteliers, repeat bookings are very important to the future of their businesses, according to 2015 TripAdvisor data. The goal is to get busy people to engage with your brand and build a valuable relationship that keeps them coming back to you again and again. But once your guests click on something, what then? What do you do with the engagement you generate? Like you, Netflix is in the engagement business – getting consumers’ attention and holding on to it – and no one does it better. From its extensive use of personalization to its intensive analysis of engagement metrics, the rise of Netflix has enormous implications for businesses like hotels that depend on consumer engagement and loyalty. Netflix goes to great lengths to keep customers’ attention by delivering the right content to the right person at the right time. As a hotelier, you understand the power of forming genuine relationships with your guests. But, even the savviest hoteliers, especially the marketing department, find it a never-ending challenge to reach audiences with their content, turn attention into engagement, and ultimately, generate repeat bookings. Here are five lessons your hotel can learn from Netflix, to develop personal relationships and lifelong customers with your guests. Remember when the week’s “must see” TV shows were all on Thursday night between 8 and 11pm? The growth of on-demand streaming services like Netflix have given consumers complete control over when, where, and how they consume content. And yet, many industries, including hospitality, have been slow to act on the profound implications of on-demand. Hoteliers have a problem: A Netflix problem. Guests expect to get relevant information at their convenience. With many hospitality brands, it’s not always possible to get answers to questions or to book a stay or services on demand. The solution? Hotels need to adapt to this by making services and information available at the guest’s convenience. With the prevalence of smartphones, travelers are increasingly using their mobile devices to not only research and make reservations, but also to book services on the road and to share their experiences. Hoteliers need to examine how they can leverage mobile technologies to reach guests on their chosen platform in order to improve guest experiences before, during and after their stays. Think about it: When you are interested in a topic or considering a purchase, you don’t stop at just one piece of content. Engaged consumers “burst” their engagement – consuming a large volume of relevant content in a short amount of time. It’s the purchase-path equivalent of binge-watching episodes on Netflix. The proximity of visits to TripAdvisor to purchase indicates that user reviews are some of the final and pivotal criteria in the hotel selection process. Essentially, what your guests say about you online and how you stack up against your competition are critical components that can influence the purchase decision for prospective guests. This is why managing your online reputation by responding to reviews and making operational changes based on trends in the data is so important. Another highly effective way to keep your guests’ attention while they’re engaged? Triggered email campaigns. 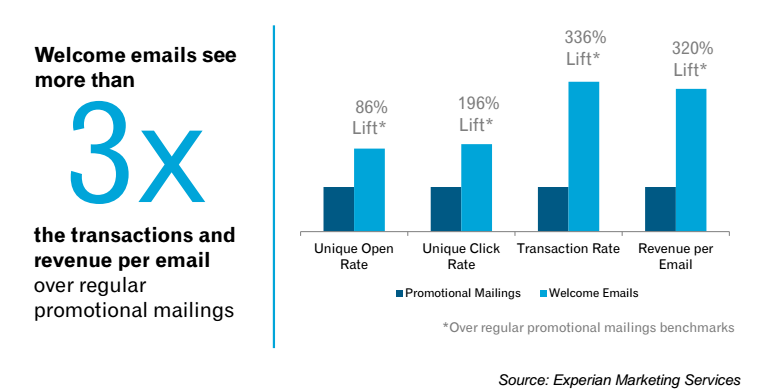 Experian found that welcome emails, sent immediately after a consumer email is first collected, have 3x the transactions and revenue per email over regular promotional mailings. The trick for hoteliers is how to accommodate this “bursty” behavior, so you can hold your guests’ attention while you’ve got it. Figure out which guest behaviors can be leveraged to induce further engagement. For example, a booking confirmation email can be leveraged to encourage a guest to book with the spa or buy tickets for a wine tasting event during his or her stay. The best way to do this, is to learn more about your guests. If you have a single view of all customer data, you can start to find trends in their preferences and behaviors. With this information, and some trial and error, you can figure out how to send your guests the right content at the right time in their engagement with your brand. The guest’s path to booking has changed. With the rise of online review sites and OTAs, hoteliers are no longer in control. Like primetime television, traditional booking journeys now seem hopelessly linear and outdated. In the Netflix era, individuals come in and out of their own personal booking journey on their own terms. Your role as a hotel marketer is to help them navigate by delivering the right message to the right guest at the right time – essentially, whenever and wherever they’re ready to engage. While you can no longer control how your guests engage, you can serve as an expert guide who is there to assist guests on their booking journey. Of course, you have to provide content that’s useful. Generic blast emails don’t cut it anymore. But, with the mountains of guest data available in your hotel systems and online, you can help put your guests on the right path with personalized, targeted marketing messages. To do this, hotel marketers have to design and orchestrate a personalized guest journey, based on what they know about their guests. A good guide doesn’t take a novice climber on the most difficult trail up the mountain. Being a guide to your guests is about listening to the data. A personalized booking confirmation email. Guests who have previously stayed with the hotel and like golf may receive a call-to-action to book a tee time. Those traveling with children may receive a call-to-action to book children’s activities. Your goal throughout this process isn’t just to increase spend per guest. The goal is to exceed expectations. Give your guests an experience with your brand that feels personalized, so they fall in love with your brand and go out of their way to book directly with you again and again. The average guest visits review sites 38 times before booking, according to Experian data. Additionally, research done by Google shows that there’s little chance someone is going to buy your product or service without first engaging with 10 pieces of content. This means you need to brainstorm a lot of content, based on different segments of guests. Here again, hotel marketers have an opportunity to learn from Netflix. The company is masterful at packaging content and recommending related content based on what their data tells them about the behavior and preferences of their customers. In fact, 75% of its views come from some kind of recommendation or personalized ranking. Because you watched Breaking Bad, Netflix serves up recommendations based on that action. It’s all about designing and delivering those personalized content experiences and making it easier for guests to engage with your hotel’s brand in a more meaningful way. So what is this engagement stuff really about? As marketers, we talk a lot about listening to guests. In digital marketing, this means listening to the data and then acting on it to give your guests exactly what they want when they want it to increase engagement with your brand, ultimately leading to guest loyalty and more direct bookings. Send fewer emails – be smarter, not louder. The mantra that hotels can learn from Netflix is simple: Getting attention is hard so once you’ve got it, hold on to it. Use your data to deliver relevant content to the right guests at the right time. Respecting your guests means really getting to know them, who they are, what they like, and what they don’t. Hotels can take a lesson from the rise of Netflix. In this on-demand era, your guests are in control. Your service and marketing tactics need to change to keep your guests tuned in and loyal to your brand. Great innovative information to boos your business.I will sure adopt such business enhancement solutions.